When you instantiate a multitimbral plug-in like Independence Pro, you get a comprehensive choice of output routing structures. Multitimbral virtual instruments can address multiple mixer channels in Samplitude. Here's how. Samplitude developers Magix bought out sample-library manufacturers Yellow Tools several years ago, and one result is that Samplitude Pro X now includes the latter's Independence Pro software sampler. This comes with a 12GB sound library, unless you buy the extended Samplitude Pro X Suite, in which case you get a massive 70GB library. 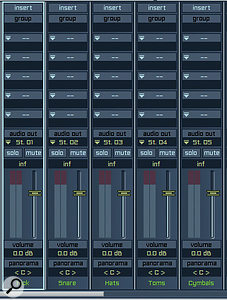 Independence Pro as also available as a VST plug-in, allowing it to be used in other DAWs. Like most software samplers, Independence Pro is a multitimbral instrument which is capable of addressing multiple output pairs. One question I often get asked is how to set this up — for instance, so you can assign an Independence Pro drum kit such that the individual kit pieces emerge on separate Samplitude mixer channels, thus allowing you to process the kick, snare, hi-hat, toms and cymbals independently. Let's look at how to create a new project that incorporates this sort of setup. Begin by opening Samplitude, and from the start wizard choose 'New multi track project (VIP)'. A VIP project setup window should now appear. For the sake of simplicity, set the track number to '1 Track', so that when you click OK, a new project containing just a single track will be created. Now click on the track plug-in slot below the pan fader and choose VSTi / MAGIX Synth / Independence. A multi-channel routing dialogue window will open. 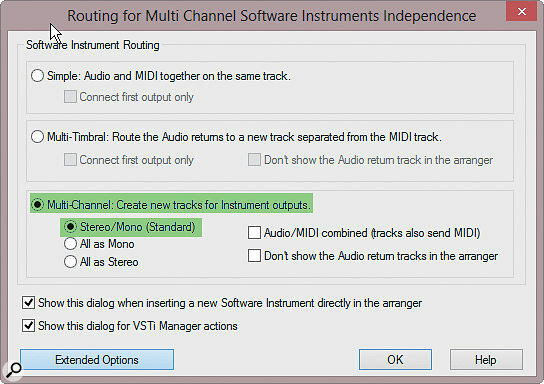 For our purposes, we need to select the third choice, which is 'Multi-channel: Create new tracks for Instrument outputs'. Note: if you click on the Extended Options button you will be given some extra choices as to how these multiple channels will appear. The default is Stereo/Mono (Standard), but you also have the option to have the outputs assigned 'All as Mono' or 'All as Stereo'. In this case, let's stay with Stereo/Mono (Standard). Two other settings of interest are 'Audio/MIDI combined tracks also send MIDI' and 'Don't show the audio return tracks in the arranger'. We'll leave these unticked. Click OK to confirm your choices and Independence Pro will open. Now, when you zoom in vertically in the VIP, you will see that 16 tracks have been added below the first track: eight stereo tracks labelled 'IND ST 01-08' and eight mono tracks labelled 'IND MO 01-08'. The original track we created holds the MIDI data that will feed Independence Pro, and the 16 new tracks are where the Independence Pro multiple output assignments will be routed. We now need to load a drum kit within Independence, so click on the light-blue horizontal area labelled '01 click here to load instrument'. From the menu, choose 'Independence Pro — Instruments / 01 Acoustic Drum Kits / Drum Kit 01 (sticks)'. This kit will be loaded into Independence as a Layer and is ready to play using your MIDI controller. Notice that the virtual keyboard highlights the loaded samples in white. 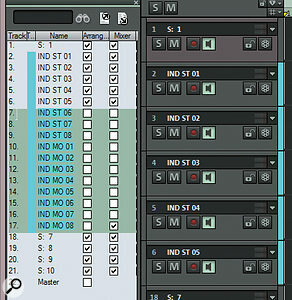 To test our drum-kit routing, we can load a MIDI loop into the Independence Pro track. When you begin playback, you will notice that the entire drum kit is routed to the output labelled 'IND ST 01', so in essence the entire drum kit is mixed down to a single stereo track within Independence Pro. I'm now going to take you through the process of reassigning the Independence outputs so they appear in Samplitude as separate tracks. Make sure the Independence Pro GUI is open and the Modules tab active. This workspace enables you to adjust many parameters for the active layer, and is also where outputs can be re-routed. Click on the Modules tab again or the Content button at the top right of the window, below the help menu. The Content window will now open at the left, and under the Sections header you'll see a list of the five drum sections that are available to be routed: Snare Drum, Cymbals, Bass Drum, Toms and Hi-Hat. We need to re-route each of the sections to a different stereo output. Here, the bass drum has been routed to the 'CUSTOM 1' output. Beginning with the bass drum, select it in the Sections list, then go to 'Output', which is directly below the Content button at the top right of the Modules window. Click on the area below and, from the menu, choose 'CUSTOM 1 stereo'. Next, select the snare drum from the Sections list, click on the Output menu and assign it to the existing 'CUSTOM 2 stereo' output. Next, let's reassign the hi-hat to a new output, rather than an existing one: highlight the hi-hat in the Sections list, hit the Output menu and choose 'New custom channel / stereo'. This will create a new output labelled 'CUSTOM 3 stereo'. Repeat the procedure with the Toms and Cymbals sections, and the five different kit pieces will have been given their own custom output channels. Once everything's set up, the individual kit pieces appear on separate channels within the Samplitude mixer. However, it is still necessary to do one more manoeuvre to complete the routing. We need to switch from the Independence Pro Modules tab to the Mixer tab. Upon doing this, you should now see the five custom channels labelled in green 'Custom 1' to 'Custom 5'. I suggest renaming these channels to match the appropriate drums. This can be done by clicking on the green text and typing in the new name. In my screenshot, I've renamed them, from left to right, 'kick', 'snare', 'hats', 'toms' and 'cymbals'. Now we need to reassign the outputs of these channels. Each of the five channels is currently assigned to audio output 'St.01', as can be seen on each channel strip below where it says 'audio out', just above the solo and mute buttons. The kick output is left as is. For the snare channel, click on 'audio out (St 01)' and from the menu choose 'stereo / stereo out 02'. Repeat for the hi-hats channel and assign it to 'stereo out 03', then the tom channel to 'stereo out 04' and the cymbals channel to 'stereo out 05'. 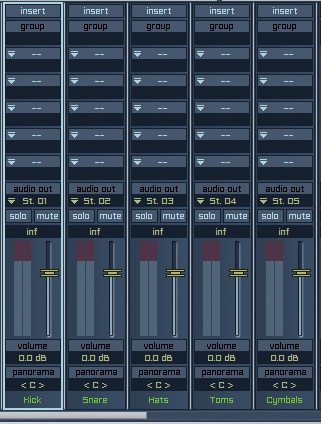 When you begin playback, you should see meter activity in Samplitude for the tracks labelled 'IND ST 01' through 'IND ST 05' (you may want to rename these as well), and if you open the Samplitude mixer, you can adjust the relative levels of the drums independently, as well as soloing, muting and panning the individual kit pieces and adding different effects to them. If more tracks have been created than are needed, it's helpful to hide unused ones in the Track Manager. As this particular multi-output instrument is using just five stereo channels, it's a good idea to hide the unused channels. To do this, open the Track Manager from the Docker, or go to View / Manager / Track Manager. 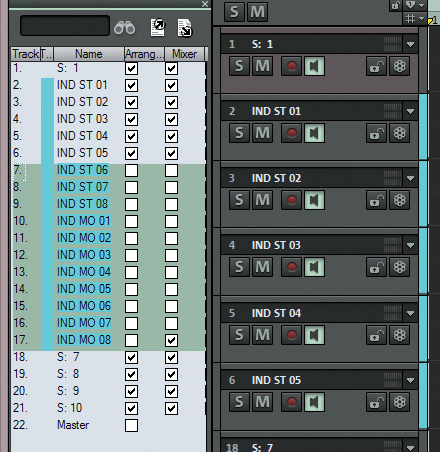 Notice that the Arrange and Mixer columns for the items 'IND ST 01' down to 'IND MO 08' are all ticked. 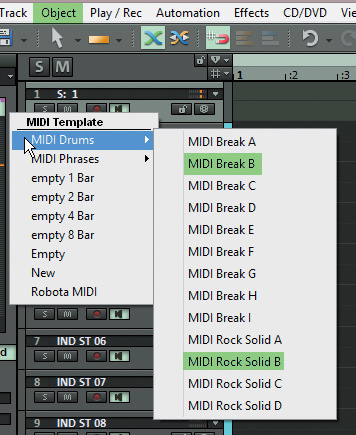 To hide the unwanted tracks, first select all the ones you want to hide. The easiest way to do this is by clicking 'IND ST 06' and then Shift-clicking 'IN MO 08', so that all tracks in between are selected. Then simply click one of the boxes in the Arrange column and one of the boxes in the Mixer column, and all these tracks will disappear from the VIP and the mixer. Now that all the correct outputs have been assigned, you can save this setting as a project. Go to the top left of the Independence Pro window and click on the small arrow to the left of Project. Choose the Save As... option to save the project with your preferred name. You can now reopen this project at any time and the custom routings will be retained.